Our Staff at Power Ranch Dental takes great pride and satisfaction in helping our patients achieve and maintain great oral health. We focus and devote our time to comprehensive and preventative patient care. All of our patients are extremely important to us and we hope to develop long- lasting, positive relationships with you and your loved ones. We are always accepting new patients and offer coupons, such as our nineteen dollar special, movie tickets and in house insurance plans, to help you with all of your dental needs. For more information, to schedule an appointment or ask about the coupons we offer, contact us at (480) 988- 2282. We offer a variety of services and options that we can discuss with you. 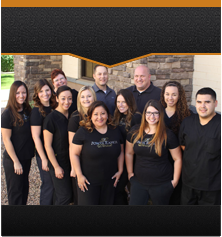 The Power Ranch Dental stuff looks forward to meeting you and welcoming you into our dental family.